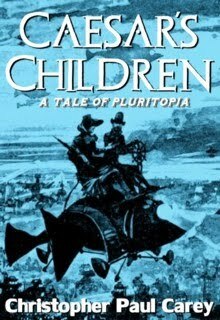 Christopher Paul Carey's novelette Caesar's Children: A Tale of Pluritopia is now available at the Amazon Kindle store. What if there were a world where all the utopias from nineteenth-century literature coexisted? And what if the nations of that world were divided into two types of utopias—the Aspirants, who seek the create the best of all possible worlds for themselves, and the Gildeds, who also seek the perfect world but long to force their own ideals on the other utopias? On the Pluritopia World, the citizens glide through the heavens in the bellies of fish-shaped airships and learn about the exotic goings-on of the sundry utopias by means of aether-powered telephonoscopes. But when a mysterious woman from the Earth’s center appears suddenly in the tranquil Pacific Northwest paradise of France-Ville, the ideal world finds itself on the brink of the unimaginable—a great conflagration that threatens to scorch the Pluritopia World to cinders. This novelette first appeared in the anthology Tales of the Shadowmen: Grand Guignol.